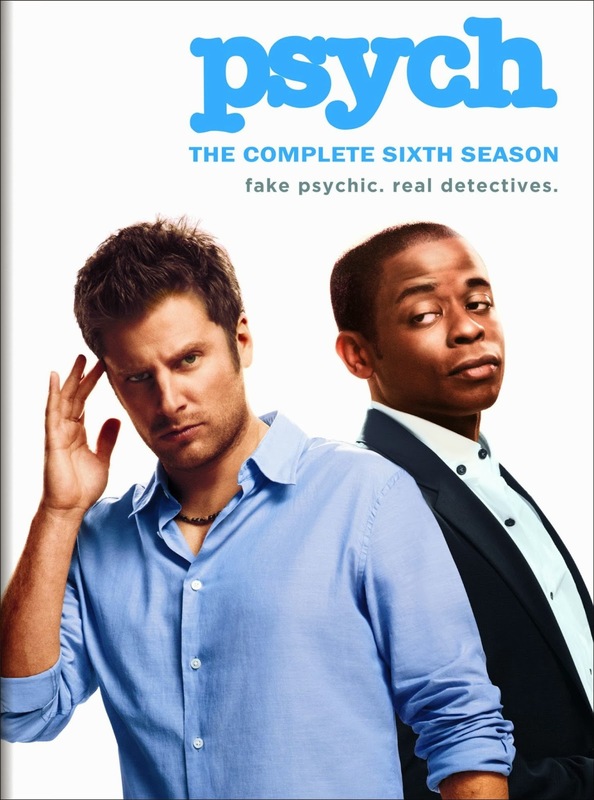 Psych is a favourite series of my better half’s and I must admit it is one that I really enjoy too, though I don’t watch it with the same regularity. This episode was the third of season 6 and it was when the series did the, apparently, mandatory vampire episode. The show itself centres around Shawn Spencer (James Roday), a man with heightened observational skills and a gut instinct for detection and his best friend and business partner Gus (Dulé Hill). Shawn pretends to be a psychic, as the police thought he knew too much and might be a suspect, and the tagline on the DVD set sums it up, “fake psychic, real detectives.” Psych is good at throwing geek orientated trivia and references in and so I will try and point out much that is there and said references actually starts with the opening of the episode as the Smashing Pumpkins’ “Bullet with Butterfly Wings” plays with the lyrics, “The world is a vampire, sent to drain”. We see Lassiter (Timothy Omundson) a taciturn, old fashioned cop (and very suspicious of Shawn), go into a bar and order a drink. 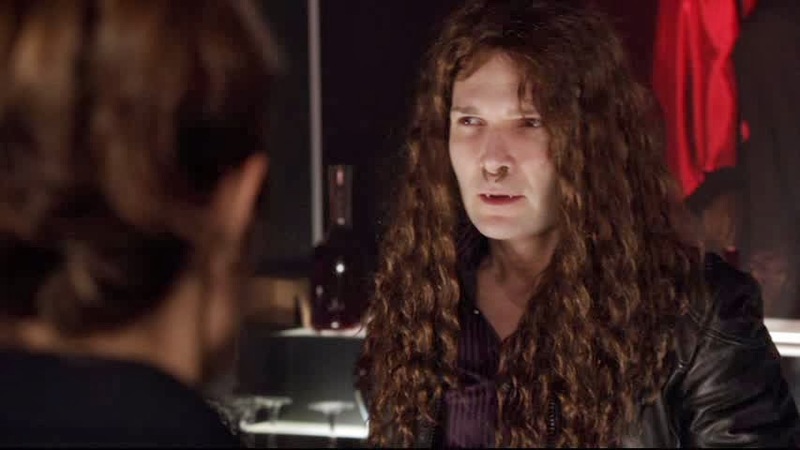 He is approached by a woman, we find out later she is called Marlowe Viccellio (Kristy Swanson, Buffy the Vampire Slayer), she knows his name but doesn’t say how and wears an unusual pendant. She goes to the bathroom and, when she doesn’t return, Lassiter goes looking for her. The bathroom is empty. In a car park a man gets to his car but it won’t start. He pops the hood but can’t see the problem. 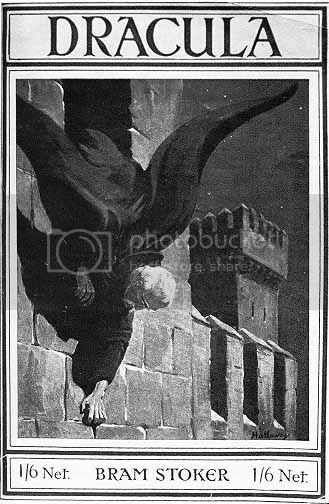 A cloaked figure goes over the roof of the car and jumps on him. 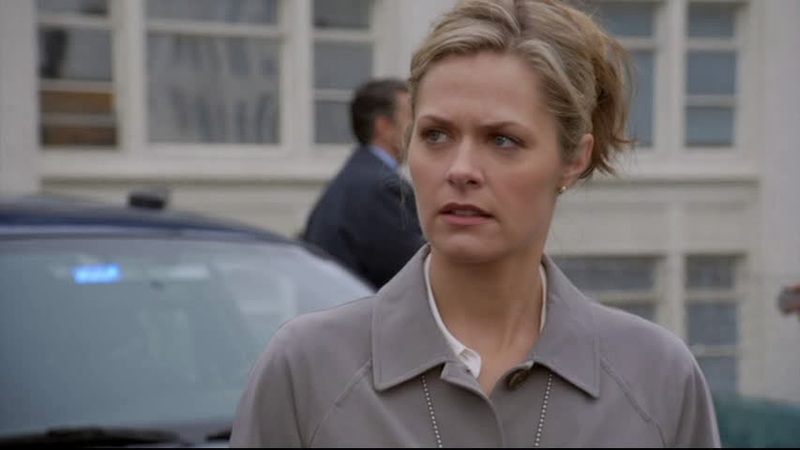 The next day cop and, at this point in the series, Shawn’s girlfriend, Juliet (Maggie Lawson) reaches the car park, which is now a crime scene as the attacked man is dead. Shawn and Gus followed her there and Lassiter, for the first time ever, is last to arrive. He is preoccupied by Marlowe and distraught when he finds her pendent in the dead man’s hand – he later discovers he is her alibi as she left the bar but watched him from afar. With puncture wounds on the victim's neck and both wrists and paleness of his skin, Gus and Shawn are convinced they are dealing with a vampire. Following this we get the investigation and, as it is whodunit, I won’t spoil that. I will look at the further references that are in the show, however. When Shawn declares it is a vampire, Gus shouts out, “Sookie is mine!” referencing True Blood. Shawn likens Gus to Omar Epps in Dracula 2001, though the US title of Dracula 2000 is used. 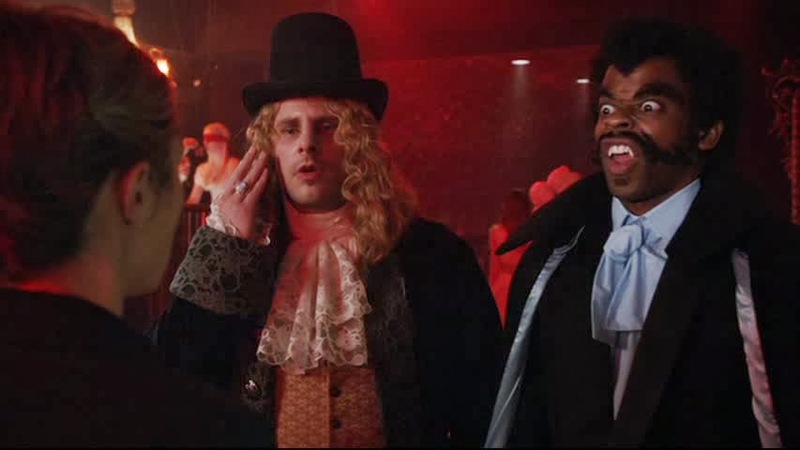 When checking out a vampire bar, Shawn dresses as Tom Cruise’s Lestat from Interview with the Vampire and Gus dresses as Blacula - though no one seems to remember the film and he is called Count Chocula on occasion. In the bar – whilst Cry Little Sister plays – the barman is played by Cory Feldman (The Lost Boys, Lost Boys: the tribe, Lost Boys: The Thirst & Bordello of Blood) and his character is credited as Thorn – the name of the vampire’s dog in the Lost Boys. Two unmet housemates of Marlowe are called Jake and Eddie, after Jacob and Edward from Twilight and the third housemate, Lucien was played by Tom Lenk who was a regular in the Buffy the Vampire Slayer series, reprising the character in Angel and was in the Thirst (2007). At one point Shawn takes a phone call and in the background we can see the eerie Mina as a vampire scene from Dracula (1979). 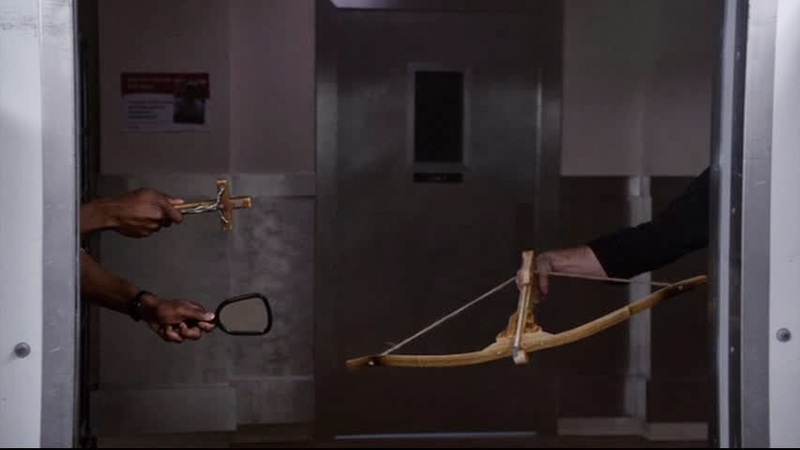 Let the Right One In, Queen of the Damned and Quantum Leap are all mentioned and whilst a rhyming couplet is made of Blacula and Quantum Leap’s lead Scott Bakula we should also remember that Quantum Leap had a vampire episode. As I say, I enjoy Psych and know the characters so they really do work for me. I also enjoyed the geek fest of references. The actual plot of this episode was perhaps a little thin but funny – especially when the prime suspect is arrested and it is a cat that Shawn and Gus believe to be a shape shifted vampire. 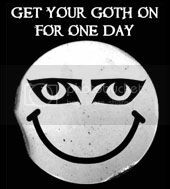 One issue was, however, that the plot revolved around the scarcity of type O Negative blood but, even though it is a rare blood type, it is not as rare as the show made out - that said it may just have been an excuse for another reference, to the band of the same name. Enjoyable stuff though. 7 out of 10. The episode’s imdb page is here.